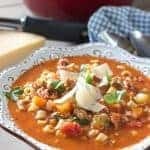 30 Minute Minestrone Soup with Sausage! – This soup is so easy and versatile! Made with wholesome ingredients your whole family will love! This is our go-to soup when we are in need of a soup fix! 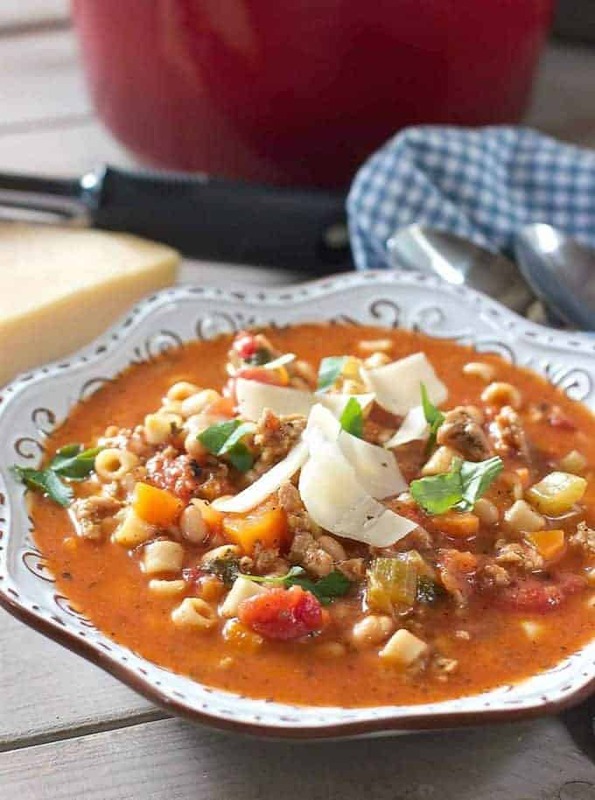 30 Minute Minestrone Soup with Sausage recipe and some exciting news to share! It’s wet, wet, wet in Seattle..well, I guess it’s only March so it’s gonna be wet in Seattle for awhile longer, (insert super sad face). I am such a sun girl, I wonder at times why I love it here so much. November to May, and sometimes as late as June, it is as dreary as it gets. Soup is always on the menu here. I love to make a big batch on Fridays so no cooking over the weekend! I have some pretty big news to share! I have been working on this for awhile and I am so excited to announce….there will be a new regular guest blogger on Laughing Spatula! She needs no introduction. She is the Rory to my Loralei, the Abbot to my Costello, the Julie to my Julia…the, okay you get it :). She is my very own Rachel. My grown up, very talented daughter who will someday become the owner of this here blog. This kid has a ton of talent (okay, wearing my Mom hat), but she does! She is currently an HR Manager that spends her free time cooking, and working on DIY home projects. Her place is a gold mine of ideas and so beautiful! Hopefully she will share a few of her projects as well. For now she will be concentrating on the marketing and social media elements of this blog, because I have no..and I mean no skills in either area! Oh millennials…you sure know your stuff! She has already made a huge impact! 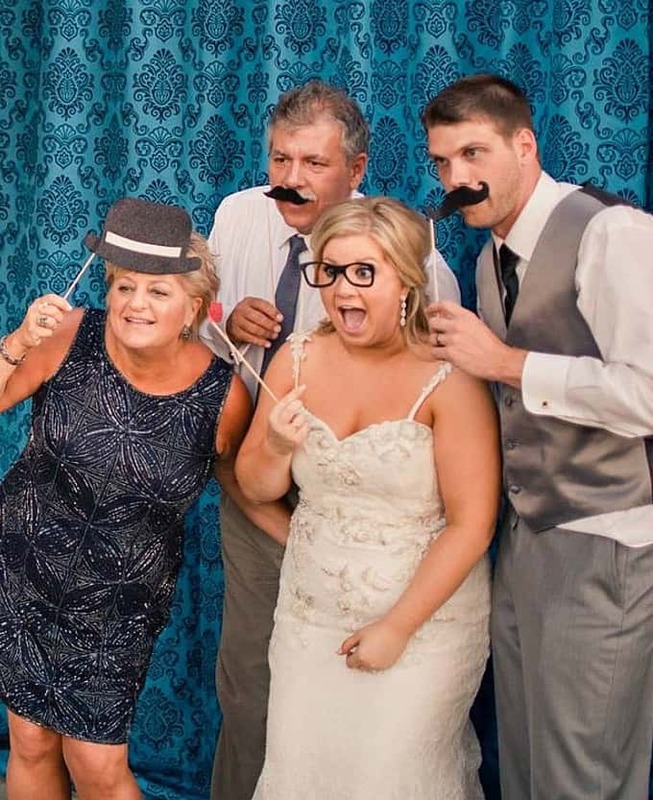 Here we all are at her wedding. My dear hubs Marty and the son-in-law of my dreams, Greg who we adore! Rainbows and unicorns? Yup…. And the family wouldn’t be complete without a pic of her sweet doggie Walter. As in Walt Disney because my kiddo is a Disney fanatic! You can catch Walter on his Insti account @WigglyWalter. So where am I going? No where! I am still the Laugh behind the Spatula, just working on reducing my work load a bit so we can do some traveling. Marty is retiring soon and we have so much to see! 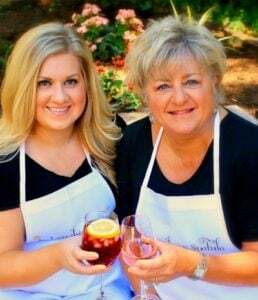 So, stand by for some really great recipes from my Little Spatula :). 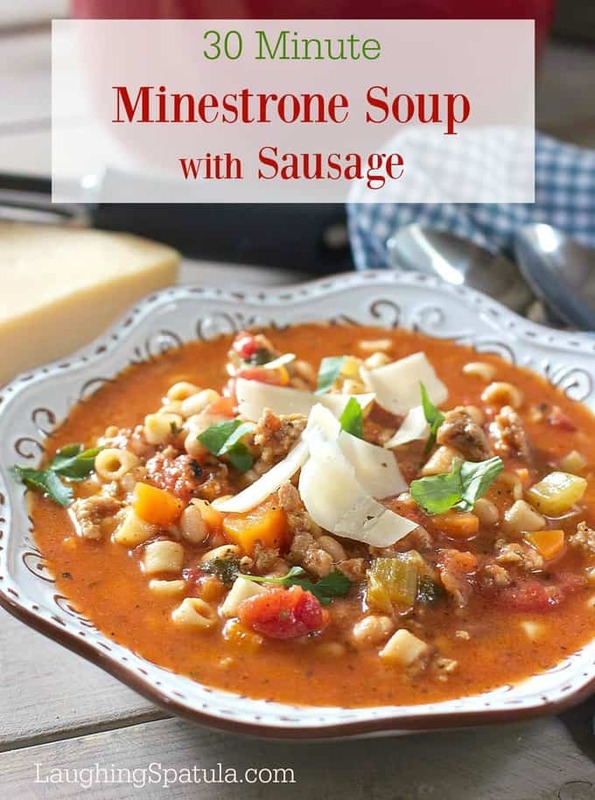 So, about this 30 Minute Minestrone Soup with Sausage! I have been making this for years…it’s my go to meal when I don’t feel like cooking. Also love it for meal prep lunches! I use chicken sausage because it’s healthier and we don’t like the grease that pork sausage renders. I you use full fat sausage you may want to remove some of the oil. You can make this soup a hundred different ways by adding, zucchini, all kinds of beans, even sub the sausage for ground beef! Make this your own family favorite! You can see all my soup recipes here! A super quick easy soup that feeds a crowd! Big flavors with fresh veggies and sausage! Heat large dutch oven or soup pot to medium high. Add onion, carrots, celery and parsley to sausage and cook until veggies are just tender. Add tomato paste, crushed tomatoes and diced tomatoes. Cook for 2-3 minutes. Add chicken stock, beans, pasta, salt and pepper and bring to a simmer. Cook for 10 minutes or until pasta is al dente. Taste for seasoning. Serve with fresh parmesan cheese and bread! Great soup recipe! I couldn’t find crushed tomatoes for some reason so I used 2 cans of the fire-roasted diced and it was just fine. I added fresh green beans just because they sounded good. Bonus – it really can be done in 30 minutes. This looks so delicious and colourful! Thanks for igniting my taste buds. This looks delicious! I can see myself making a large amount of this and eating it throughout the week. Yummy! One of my all time favorite soups! I’m in the mood for this. Loved your soup and you got a pretty daughter!! Welocme here Rachel. And any soup with sausage in it has got to be amazing.